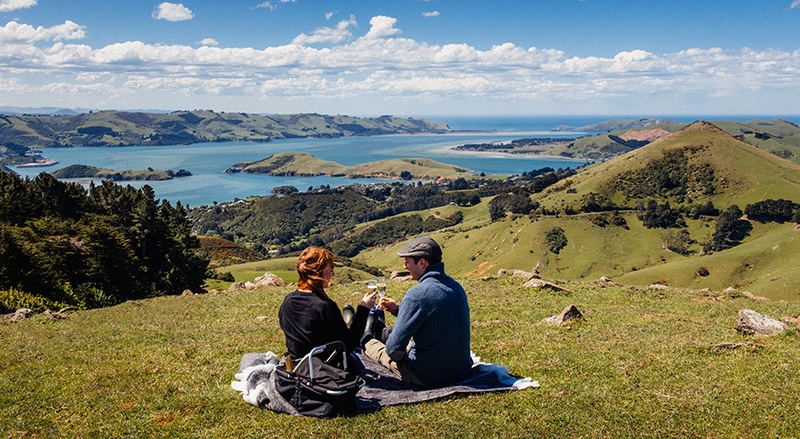 Set on the spectacular Otago Peninsula, Camp Estate is surrounded by rolling hills, lush pasture and hand built stone walls only a stone’s throw from some of the world’s southern most wildlife reserves. Discover it for yourself - step outside, feel the serenity, take a breath and walk. Camp Estate’s gentle walking track is an easy 10 minute meander through a working farm to a picnic spot like no other. Set high on the peninsula with spectacular views the length of the Otago Harbour and a panoramic view of the ever-beautiful city of Dunedin, this is a unique spot surrounded by rugged beauty. Stay a while, savour your picnic and perhaps enjoy a glass of champagne while the sun sets behind you. Camp Estate is timeless luxury in idyllic surrounds. As befits such a position the service is impecciable, seemless and all the while with guaranteed privacy.